The Round houses originated in Western Europe before the Roman occupation. It was constructed in a circular plan using walls made of stone or wooden posts joined by wattle and daub panels and a conical thatched roof. Later in the 20th century these house were built using techniques such as cob, cordwood or straw bale walls and reciprocal frame green roofs. Round houses ranged in size from 5m to 15m diameter. The roofs are conical with a pitch of about 45 degree. These round houses were also popular in Britain since Iron Age. A palloza is a traditional house found in the Serra dos Ancares in Galicia, Spain. 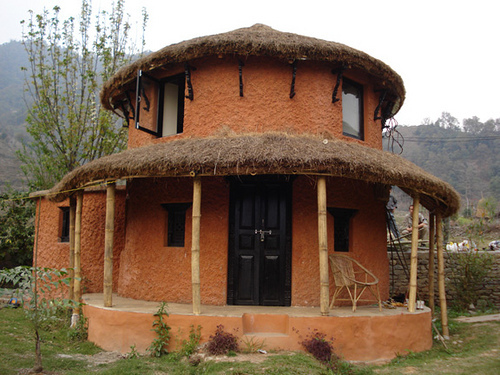 These houses are also a round house. It is constructed in circular or oval plan, and about ten to twenty metres in diameter. These types of house are built to withstand severe winter weather. The main portion is made of stone and is divided internally into separate areas for the family and their animals with separate entrances. The roof is conical shaped and are made of rye straw on a wooden frame. Chimney is not attached to these houses, the smoke from the kitchen fire seeps out through the thatch. Round house became famous in many countries including England, Wales, Scotland, Papua New Guinea, Spain, South Africa, North America and Italy. These countries made changes to the construction plan as per their climatic condition and used various materials.